About a year ago Ben Turk's lab published a large scale experimental effort to determine the substrate recognition preferences of most yeast kinases (Mok et al. Sci. Signal. 2010). They used a peptide screening approach to analyze 61 of about 122 known S. cerevisiae kinases in order to derive, for each one, a position specific scoring matrix (PSSM) describing their substrate recognition preference. In the figure below I show an example for the Hog1 MAPK where it is clear that this kinase prefers to phosphorylate peptides that have proline next to the S/T that is going to be phosphorylated. Figure 1 - Example of Hog1 substrate recognition preference derive from peptide screens. Each spot in the array contains a mixture of peptides that are randomized at all positions except at marked position (-5 to +4 relative to the phosphorylatable residue). Strong signal correlates with a preference for phosphorylating peptides containing that amino-acid at the fixed position. As was previously known, most kinases don't appear to have very striking substrate binding preferences. Still, these matrices should allow for significant predictions of kinase-site interactions. These matrices should allow us also to benchmark previous efforts by Neil and other members of the Kobe lab on the structural based predictions of kinase substrate recognition. For this, I obtained the predicted substrate recognition matrices from the Predikin server and known kinase-site interactions from the PhosphoGrid database. I used this data to compare the predictive power of the experimentally determined kinase matrices (Mok et al.) with the predicted matrices from Predikin. This analysis was done about a year ago when the Mok et al. paper was published but I don't think Phosphogrid was significantly updated since then. 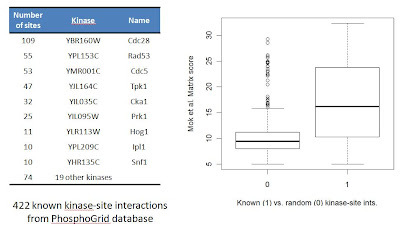 Phosphogrid had 422 kinase-site interactions for the 61 kinases analyzed in Mok et al. of which ~50% of these have in-vivo evidence for kinase recognition. 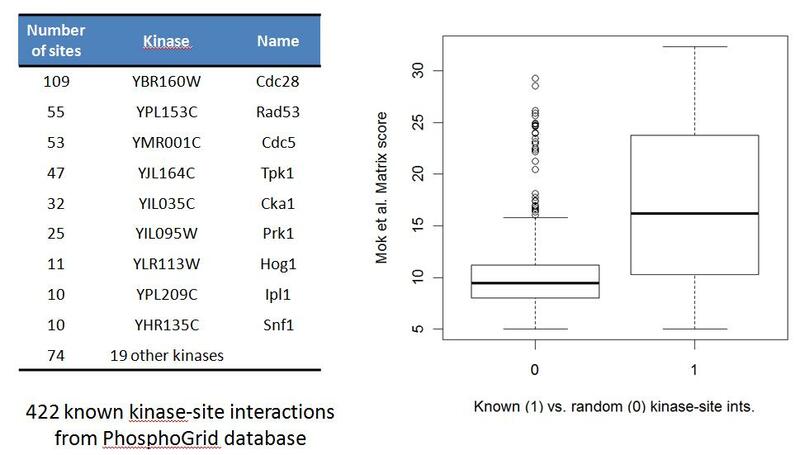 As expected, the known kinase-site interactions have a stronger experimental matrix score than random kinase-site assignments (Fig 2). Figure 2 - The set of kinase-site interactions used broken down according the kinases with higher representation. These sites were scored using the experimental matrices along with other randomly selected phosphosites and the scores of both populations are summarized in the boxplots. A random set of kinase-phosphosite interactions of equal size was used to quantify the predictive power of the experimental and the Predikin matrices with a ROC curve (Fig 3). Figure 3 - Area under the ROC curve values for kinase-site predictions using both types of matrices. Overall, the accuracy of the predicted matrices from Predikin matched reasonably well with those derived from the peptide array experiments with only a small difference in AROC values. I broke down the predictions for individual kinases with at least 10 sites known. 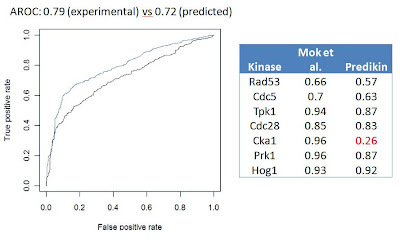 Benchmarking of such low numbers becomes very unreliable but besides the Cka1 kinase, the performance of the Predikin matrices matched reasonably well the experimental results. I am assuming here that Predikin was not updated with any information from the Mok et al study to derive their predictions. If this is true it would mean that structural based prediction of kinase recognition preferences, as implemented in Predikin, is almost as accurate as preferences derived from peptide library approaches.